Posted on 10/12/2015 in Game Recaps. The Potomac Exiles traveled up 95 to take on Rocky Gorge, hoping to claim the first round of bragging rights in a new rivalry. However, the D3 side got off on the wrong foot in what proved to be a preview of the D1 game. Knock ons, penalties and unforced errors saw the Potomac Exiles dig themselves into an early four try to nothing hole heading into halftime. The team looked much better in the second half, but the damage was already done. Fullback AJ Johnson, playing in his first game with the club, scored 5 minutes after the break to put the Potomac Exiles on the board. Winger Zolen “Z” Rodriguez and 8 man Jake Sprang followed up Johnson’s score to close the gap to 33-17, but Potomac couldn’t keep up the frenetic pace required to get back in the game. The hosts scored to extend their lead, followed by a try from Justin Stefanon who powered through a number of Gorge defenders to again make it a two possession game with ten minutes left. Gorge responded with a try and a penalty kick at 73′ and 78′ to make the final margin, 48-24. 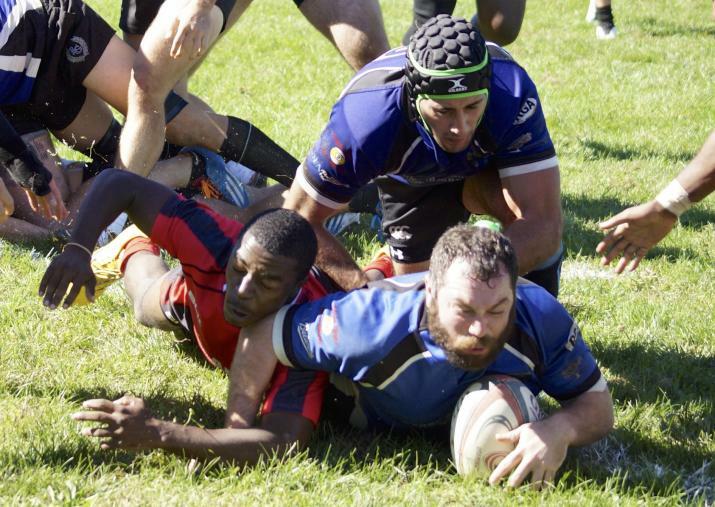 In it’s first match since it’s promotion from DII, Rocky Gorge rocked the defending DI MAC Champion, Potomac Exiles, taking advantage of Potomac’s penalty trouble to blank the Exiles, 33-0. Potomac could not maintain it’s attack with multiple penalties and the boot of Gorge’s Ben Cima made the Exiles pay for any mistakes. Four penalty kicks and strategic kicking keeping the Exiles on the back foot led to the Gorge’s inaugural victory in DI. Playing at home in Columbia, Md., Gorge took advantage of a Potomac penalty almost immediately when Ben Cima connected on a PK about a minute into the match. Vicious hits from the defense on both sides limited the scoring chances, but Gorge’s first try came after a line break by Cordero Curry and was finished off by Nick Sylor for the score. Cima’s conversion brought the tally to 10-0. Another PK extended the lead to 13-0 and the defenses held each team out as both clubs threatened to score as the half ended. Gorge opened up the second half with an unsuccessful drop goal, but Cima made up for it nailing a PK in the 53rd minute to go up 16-0. Utilizing a strong kicking game in pin Potomac in their own end, Gorge manufactured it’s next try with staunch defensive pressure. Gorge caused a turnover inside the 10-meter line isolating the wing and two phases later, Matt Carroll dived in for the try. Another PK at the 70th minute lengthened the lead to 26-0 and second Sylor try off a forwards ball from a five-meter scrum sealed the victory in the 77th minute.